Why Is This Little-Known American Parachutist Famous in Estonia? What’s a modern, abstract sculpture in honor of an obscure American balloonist doing in the capital of Estonia? Good question. The man in question was named Charles Leroux, and though you probably have no idea who he was, he once found fame in the U.S. and abroad demonstrating something that seems commonplace today: parachutes. Leroux was rumored to be the grandson or great-nephew of Abraham Lincoln (he wasn’t). He wasn’t even named Leroux—his birth name was reportedly the rather more prosaic Joseph Johnson. He appears to have been born in Connecticut in the 1850s. At some point, Leroux must have realized that it would be more profitable and exotic to take on a French-sounding name—especially because he adopted a French-seeming sport that had been making waves worldwide since the late 1700s. 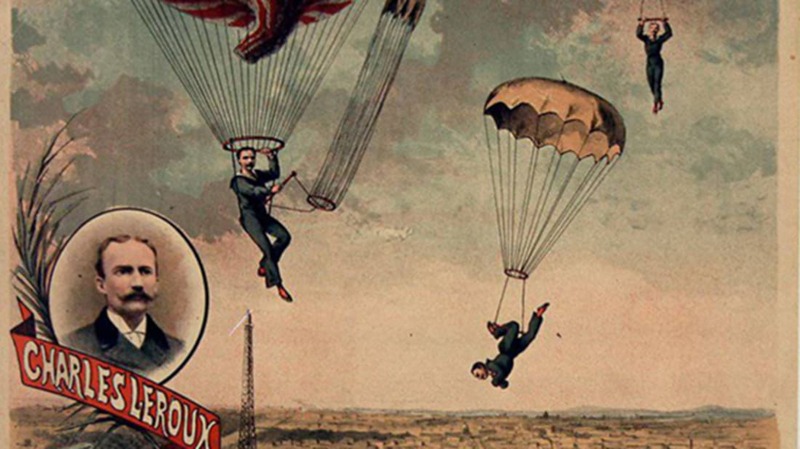 By the time Leroux started tinkering with parachutes and balloons around the 1880s, the French were the undisputed kings of aviation. From the Montgolfier brothers, who invented the first hot air balloon anyone could actually use, to Jean-Pierre Blanchard, who managed to cross the English channel by balloon in 1785, the French had pioneered early flight. Parachutes, though, were another story. Leonardo da Vinci designed an early prototype, but it took until the early 20th century for the modern version to get a patent. Meanwhile, parachuting was anyone’s game—and, like balloons before it, it was a game for daring showmen. With a spiffy new name and an apparent daredevil streak, Leroux began to test a parachute of his own design. He was already an accomplished East Coast trapeze artist and gymnast, and he designed a breathtaking parachute to top off his performances. In 1886, for example, he shut down traffic in Philadelphia (performing as “Prof. Charles Leroux”) by climbing 100 feet up the Dime Museum, clad in “light blue silk tights and satin trunks.” Before a packed and terrified audience, he jumped off of the building holding a 16-foot-wide parachute and nearly running into a lamp post (a nearby man wasn’t so lucky—Leroux ran right into him instead). The New York Times report of his feat notes that it was Leroux’s 38th ascent, and that his other accomplishments included jumping off of New York’s High Bridge. That was just one of Leroux’s leaps. His feats took him all over the world. In 1889, for example, he demonstrated the parachute he had designed—complete with backpack-style straps—to a group of impressed German officers. (Given that he jumped 1000 meters from a balloon, the equivalent of about 3280 feet, they had reason to be dazzled.) And in 1887, Leroux lent his design to Charles Broadwick, who would become one of the most famous parachutists of all time. But eventually, Leroux’s derring-do got the best of him. On September 24, 1889, he braved a difficult jump from an airborne hot air balloon in front of an audience of onlookers in Tallinn, Estonia, which was then called Reval. An errant wind swept him away toward the Baltic. A woman supposedly died of heart failure just watching the tragedy. Leroux died, too—his body was recovered by fishermen two days later. Today, a modernist monument in his honor stands in Tallinn, a strange and little-known testament to a man who managed to withstand 238 jumps before his untimely death—and whose daredevil acts with a parachute helped inspire interest in more modern versions of the lifesaving invention.